A few weekends ago I loaded up some equipment and traveled down the Trace to Jackson, Mississippi. I lived in Jackson for a small amount of time, so I’m very familiar with it’s locations, people, and communities. Jackson is a unique city for a variety of reasons, and is home to some of the most interesting and influential people in the entire Southeast. I had spoken with Southernerds founder Greg Hanks about the possibility of doing some interviews with some of his interesting Partnerds, people like us partnered with Southernerds to help promote and celebrate an educated South; “You need to talk with Phillip”. Phillip Rollins is a superhero. By day, he works with a local non-profit in the underprivileged, and often forgotten, communities in the heart of Jackson. 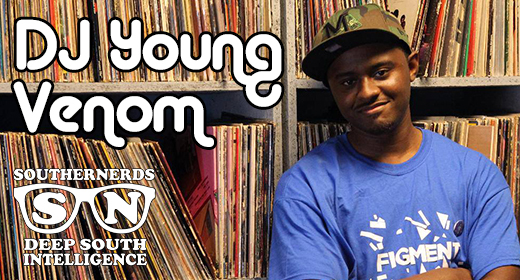 By night, he’s DJ Young Venom, an All-Star DJ utilizing social media and his love for music to take the city of Jackson by storm. The child of a single Mom who had boxes and boxes of comics, Phillip Rollins is using his love for comics, music, and his community to change the city of Jackson. Rollins work with children in the heart of Jackson shows his true character; he’s even been recognized as one of the most outstanding members of the community. Rollins started 4 The Record, a record swap convention, several years ago, and it’s quickly becoming one of the most popular events in the area. No, DJ Young Venom doesn’t typically fit a “geek mold”, but that’s one of the reasons we started this website and podcast over a year ago; lots of great people and ideals fit the geek mold, and for many different reasons. I sincerely hope you enjoy this interview; look for more soon from The Partnerd Series.